I’ve been away from being public about my art for a little while now. I’ve only applied to a single program, I’ve written no blog posts, showed no work and even turned down a few shows. I needed a break where I could think my thoughts without offering them to the world. Years ago I might have pushed on, and possibly had a breakdown. I’ve learned better. During the course of my recently completed MFA program six people I love died. Three of my four grandparents, one of whom was like a second mother to me. Two mentors. One friend and fellow artist to suicide. Just on their own MFA programs are difficult, intense cauldrons of emotion and ego and challenge and intensity of ideas and beliefs. They are the crucibles that forge us… those of us who don’t crack. The ones that did crack were measured in the bulging mailboxes and empty studio spaces at the end of each year, and there were more than a few. We put ourselves on the line, our ideas, our thoughts, our work, and those of us who are willing, our loves and lives and beliefs too. Of course, the current fashion is cynicism and snarkyness (which doesn’t call on people to put themselves out so far) but for me being on the line it is what makes the art have a soul, and while Soul doesn’t matter to some, and there is some good purely intellectual/aesthetic art, it matters very much to me. After the thesis show I had immediate offers for shows and commissions- wonderful opportunities, but not the breath of air I needed. For a full year after it I was busy, during which there was another death, the final grandparent. They all lived full lives, all died over 94, but the loss is ours and never easy. The situation of being in constant physical pain was one factor I had throughout all three years, as was being the main caretaker of my young daughter during a period where my husband was so busy he rarely even got weekends off. There were other significant pressures I won’t list. It was a hard three years. It was also intensely productive and important. At the same time I was incredibly fortunate. I didn’t have to pull my hair out over money. I had love and good friends and whether I wanted a break or not I those commissions and shows just dropped into my lap- nearly every vacation during the MFA program as well as after it. I didn’t have to look for a single show after I graduated- I didn’t have time for any more, but when I saw the pause in the stream, I took the break instead of hunting for the next one. I shut down the blog and set out to take care of everything in my life that had been held together with sealing wax for three years. I did things for the fun of them, I saw the people I love, I experienced new things and got new ideas. Like many artists, I have depression. I have anxiety and panic attacks. It is almost a cliche that artists are tortured souls and some of us think we can’t work without that (I disagree, but it is different). Chronic pain adds its own layer to one’s process. Most people looking at me would have no idea about the first two and many would never know about the pain either. There were many classes and critiques where I was clenching my fists not to scream from the physical pain in my back and concentrating hard on keeping a normal face. I have many strategies for dealing with it all. I kept on, put one foot in front of the other, did all the things I needed to do and held everything together and met every deadline, did my best work… and when I had an opening I did the sane thing I would not have done 10 years ago, and rested. You see two other people died during that time, acquaintances, but each with a compelling message. One was another suicide from depression- someone who worked himself into the ground and didn’t acknowledge the care he needed to take of himself, he pushed himself too far. The other was a car crash, a terrible random thing that could take any of us at any moment. When I resurfaced those deaths reminded me again not to take a moment for granted, and not to put taking care of myself last. I even discovered something to help my back and for the first time in seven years I’m having multiple days without serious pain. I’m breathing again. So here I am, back at work. My mind has been plotting new art, my hands have been busy, sketches and ideas form. It’s time to step back in to show my work and share my thoughts again. I leave you with this TED talk by Elizabeth Gilbert on creative genius and depression. ***Addition: Wonderfully, when I moved on to check my email I found an invitation to include a specific piece in an exciting museum show in another country waiting in my inbox. A well-timed confirmation to stepping back in indeed. The hard part with this kind of thing is knowing when to stop. At this point I’m happy with the materials. I could keep going forever, but right now there is enough material to fill the space I am using twice. The idea is to provide the variety and let the participants determine the color balance of the piece in their selections. This does make me think I want to do some themed work with dyes that do focus on a specific color range, but the project hasn’t presented itself yet. The rest of the parts for the installation are coming along… but this is the fun part. *note* There are more blues in the final set than are showing- arrangement of the curve was a little off so they are hiding under each other while the greens/teals are spread thin… but I am prioritizing making the piece over documenting the process perfectly. 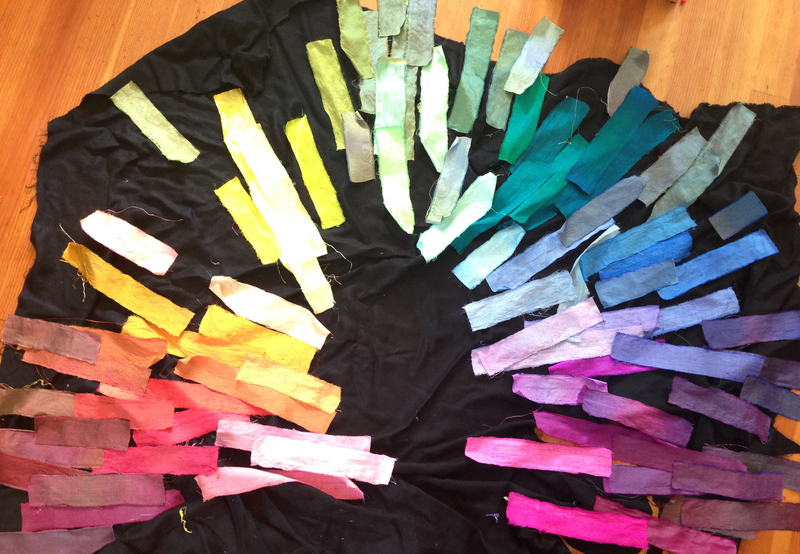 Here’s a peek into my dyeing in progress for the Living Guestbook installation. 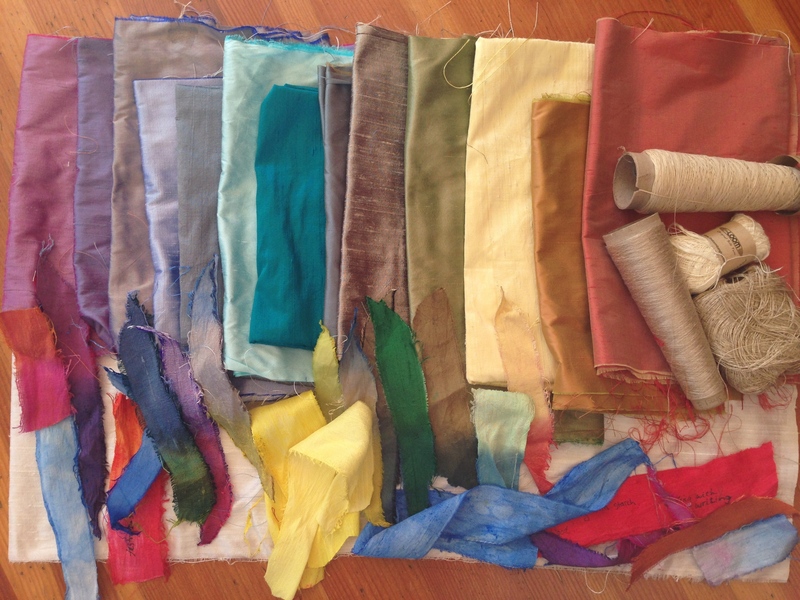 When I’m dyeing for an installation I find it helpful to lay out the spectrum of color as I go. In cases like this one where I want a fairly balanced spectrum this is especially helpful. 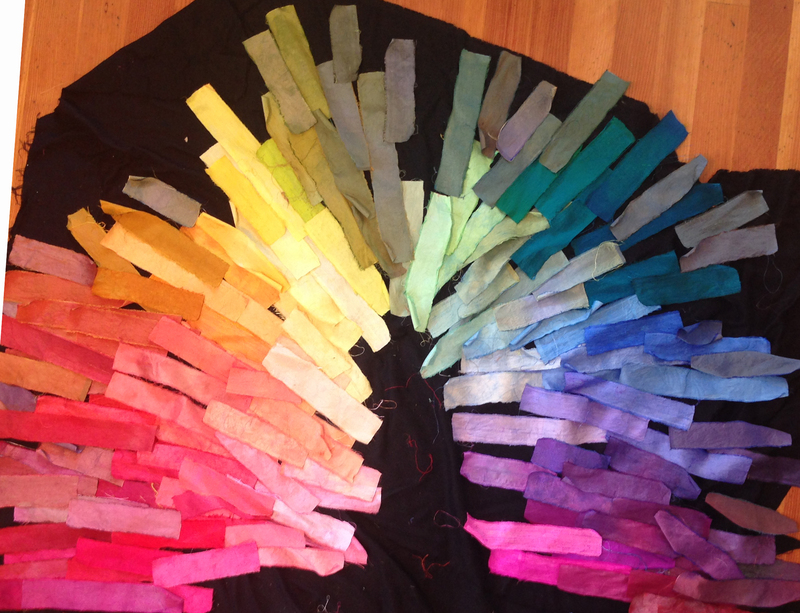 So far this is the spectrum the dyeing I’ve done yields. Looking at this the holes become more obvious. Also, different from dyeing for Identity Tapestry is that need to keep the spectrum lighter and not go too far into darks or the writing won’t show as well. This prompted a return to the fabric store for a few lighter bases to start from. They really look easter-egg to me all together like this, but I’m using them for their potential for over-dyeing and the way they fit into the whole. 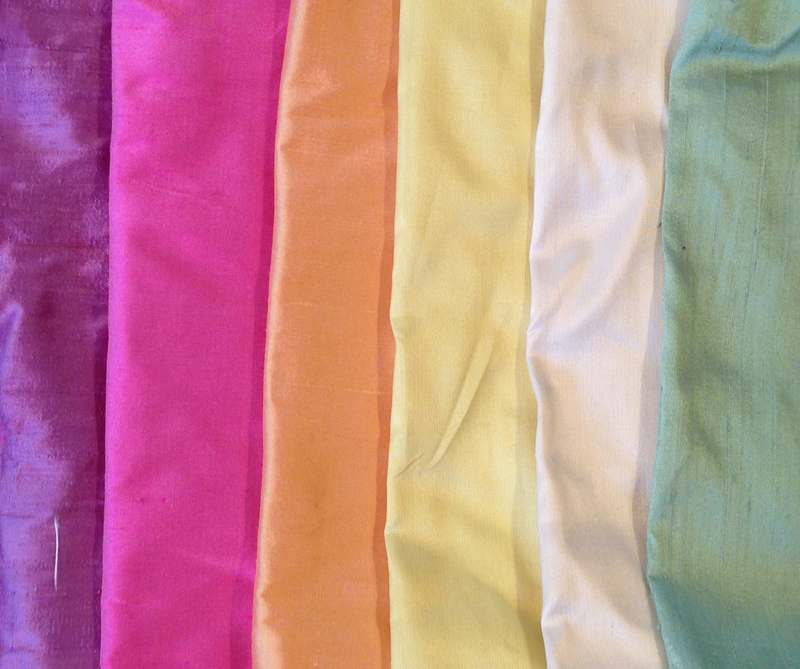 Yes, I could do everything starting at a base of white, but I find over-dyeing yields much richer colors. Also in the case of many of these fabrics, the weave already had two different colors (the warp might be blue and the weft gold, giving it a color-change look).Tthat’s something I can’t do dyeing over plain white fabric, but if I over-dye it, changes in both colors come through. That again adds a layer of depth to the colors I’m working with. I can also always go back and over-dye again as many times as I like, giving me even more layers of color coming through, especially when I use techniques that dye unevenly. 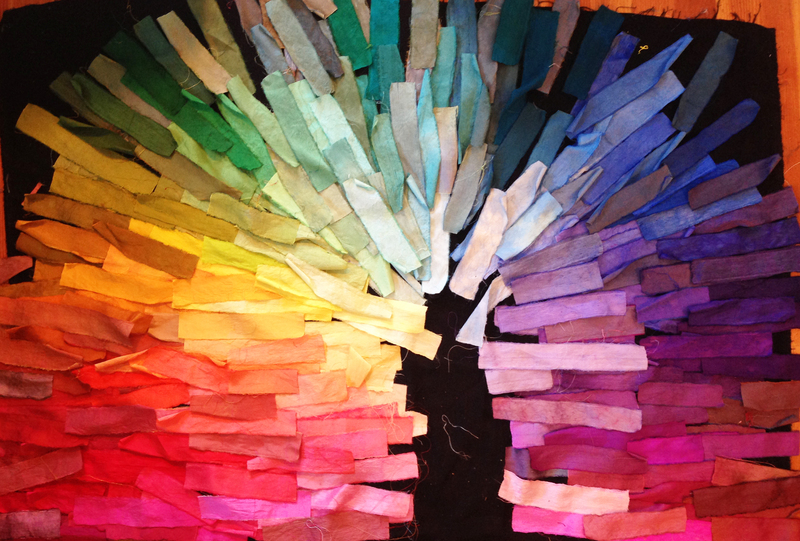 You can really see the depth in the colors when you look closely at a given strip of fabric. Still a bit to go, but loving it so far. These are some of the materials for my next installation. The swatches at the bottom are some dye, starch and ink tests. Each of these base colors (including the white) will be over-dyed in small strips for the piece. If I don’t get the color variety I want with these base colors in the first few rounds of dyeing, I’ll go back into the process with more fabric. The physical format will be similar to Dream Blanket and Transparency: a weaving with the empty warp, structured with a grid of weft, with the main weft made out of strips of this fabric. Visitors to this collector’s home will be invited to respond to questions about memory, impressions and experience. They will then get to write these on a strip of dyed dupioni silk that has been starched for structure and to better take the ink. Visually I made the piece to fit the rustic quality of their vacation home in Vermont. It will even include existing objects from the house and grounds. I really love work like this. Working to specific spaces like the theater and this home is wonderful. I like making a piece in a way I might not have thought of without the constraints or benefits of a certain goal and space, or without the interaction of other people involved. I enjoy collaborative work, and I consider working with a curator, institution or collector to be another form of collaboration. I’m looking forward to this piece!